Anthony Gerrard misses the game saving penalty to hand Liverpool their first piece of silverware in 6 years. Gerrard misses by a whisker. 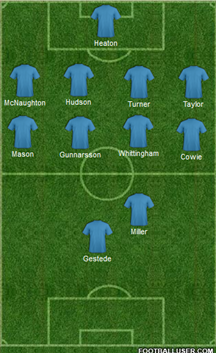 As the starting line-ups were announced, I couldn’t help but fear for Cardiff. 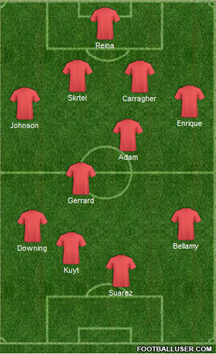 They deployed a straight 4-4-2 which would naturally leave a lot of space for Liverpool to exploit. Liverpool mirrored Cardiff’s shape, trusting Steven Gerrard and Charlie Adam to control the midfield in attack and defence. From the outset, the shapes suggested an open and enthralling game for the neutral. To say the game didn’t fail to dissapoint is an understatement. The inclusion of Gestede raised a few eyebrows ahead of kick-off, a selection which proved to be the main catalyst for Bluebird success. Gestede led the line perfectly, complimenting the movement of Kenny Miller and Joe Mason. Mackay realised that his team would inevitably be on the back foot in terms of possession. Gestede provided Cardiff with an out ball when they were under pressure and an aerial threat when they were on top. Mackay set his team up with an intent to remain defensively solid, but offer a genuine threat on the counter attack. Cardiff’s opener showcased their shift in shape when they regained possession. In attack, Mason would tuck in from his touchline, providing Gestede with two players to provide for in the air. Cowie would naturally drop into midfield from his wing to boost numbers if a move broke down which also allowed Taylor to venture forward in attack. Mason’s movement infield gave him the space he needed to execute a well placed finish on the 19th minute. Cardiff were superb without the ball. With their motivation raised by the early goal, they had something to hold on to. In defence they reverted back to a rigid 4-4-2, meaning Liverpool had to break down two banks of four if they were to find a way back into the match. Strategy will only take you so far. A game of football will not be won based on tactics alone. Superb performances from centre-back pairing Turner and Hudson set the tone for the afternoon. Frustration was creeping into Liverpool attacks, so much so that players had to shift position in order to find space and get away from commited markers. This was evident from Downing’s runs infield to avoid McNaughton and subsequent switch to the right wing. It was going to take a bit of magic from Liverpool to equalise. Ironically it was a goal mouth scramble that levelled the match. Martin Skrtel poached on 60 mintutes to put Liverpool back on the front foot. With a penalty shoot-out looming, Dirk Kuyt put Liverpool in the lead for the first time in the contest. This was a simple case of being outnumbered. Kuyt was introduced by Dalglish as a straight swap for Andy Carroll. Due to Kuyt’s tendency to naturally drift out wide, he incidently created space for himself. Liverpool doubled up on the right side leaving Taylor with two men to contend with. Kuyt’s streched finish on 108 minutes appeared to put the game out of the reach of Cardiff. It’s almost as if dejavu occured as Turner equalised on 118 minutes. He matched the presence of mind that Skrtel displayed in normal time to send the Cardiff fans into raptures. The penalty shoot-out offered so many twists and turns but when all was said and done it was the hearts of the Bluebirds which were left broken. For me, Hudson was a clear man of the match. He marshalled his troops and set the standard in an excellent defensive display. It will be interesting to see where both sides go from here. Can Liverpool overcome the odds to steal a Champions League spot? Can Cardiff regroup and possibly earn a second trip to Wembley?